Live long enough, and there’s a good chance that you will develop a cataract, a clouding of the eye’s lens that impairs vision. Currently, U.S. eye surgeons perform about 3 million operations a year to swap out those clouded lenses with clear, artificial ones . But wouldn’t it be great if we could develop non-surgical ways of preventing, slowing, or even reversing the growth of cataracts? This image, from the lab of NIH-grantee Salil Lachke at the University of Delaware, Newark, is part of an effort to do just that. Here you can see the process of lens development at work in a tissue cross-section from an adult mouse. In mice, as in people, a single layer of stem-like epithelial cells (far left, blue/green) gives rise to specialized lens cells (middle, blue/green) throughout life. The new cells initially resemble their progenitor cells, displaying nuclei (blue) and the cytoskeletal protein actin (green). But soon these cells will produce vast amounts of water-soluble proteins, called crystallins, to enhance their transparency, while gradually degrading their nuclei to eliminate light-scattering bulk. What remains are fully differentiated, enucleated, non-replicating lens fiber cells (right, green), which refract light onto the retina at the back of the eye. If you’re not watching recent work in biology, you might have thought that light microscopy hit its limits years ago. After all, it’s been around a long time. But to the contrary, microscopic imaging technology just keeps getting better and better. Here you can look with unprecedented clarity at just one of the many dynamic processes going on within a living cell. Specifically, this video shows actin fibers (orange-red), which are key components of the cell’s cytoskeleton, slowly pulling clathrin-coated pits (green), which are basket-like structures containing molecular cargo, away from the cell’s external membrane and deeper within the cell. This remarkable live-action view was produced using one of two new forms of extended-resolution, structured illumination microscopy (SIM). SIM is faster than other forms of super-resolution fluorescence microscopy. It’s also less damaging to cells, making it the go-to method for live-cell imaging. The downside has been SIM’s limited resolution—just twice that of conventional light microscopes. However, Nobel Prize-winner Eric Betzig and postdoc Dong Li of Howard Hughes Medical Institute, Janelia Research Campus, Ashburn, VA, along with colleagues including Jordan Beach and John Hammer at NIH’s National Heart, Lung, and Blood Institute, recently came up with two different solutions to enhance SIM’s spatial resolution. Cells are constantly on the move. They shift, grow, and migrate to new locations—for example, to heal a wound or to intercept an infectious agent as part of an immune response. But how do cells actually move? In this image, Torsten Wittmann, an NIH-funded cell biologist at the University of California, San Francisco, reveals the usually-invisible cytoskeleton of a normal human skin cell that lends the cell its mobility. 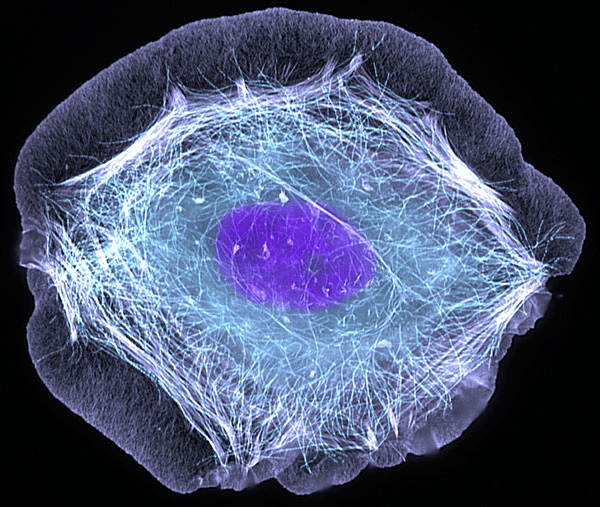 The cytoskeleton is made from protein structures called microtubules—the wispy threads surrounding the purple DNA-containing nucleus—and filaments of a protein called actin, seen here as the fine blue meshwork in the cell periphery. Both actin and microtubules are critical for growth and movement. This might look a bit like a fish net, but what’s actually caught in this image is the structure of the endothelium—the thin layer of cells lining your blood vessels that controls the flow of molecules in and out of the bloodstream. The red lines are the actin filaments that give each endothelial cell its shape, while the purple are proteins called cadherins. Most of the time, the actin “ropes” and cadherin “glue” act together to form a tight seal between endothelial cells, ensuring that nothing leaks out of blood vessels into surrounding tissue. However, when endothelial cells sense an infection or an injury, the cadherins open gaps that allow various disease-fighting or healing factors or cells present in the blood to breach the barrier and enter infected or injured tissue. After the infection subsides or wound heals, the gaps close and the blood vessel is once again impenetrable.